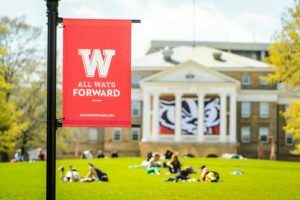 Jennifer (Jen) Fandel has worked as the administrator of the UW-Madison Writing Center since April 2017. In this position, she wears many hats, including handling communications and marketing for the Writing Center’s programs. Much of her time is spent organizing and publicizing the Writing Center’s workshops, which have numbered around 80 sections for the last few semesters. 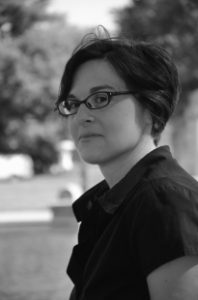 She has a background in publishing and has volunteered for a number of nonprofit literary and literacy organizations. I have two words of advice on using social media in the Writing Center—embrace it! And, to be absolutely honest and establish my hard-won credibility on the subject, let me say that I’m, personally, no social media devotee. 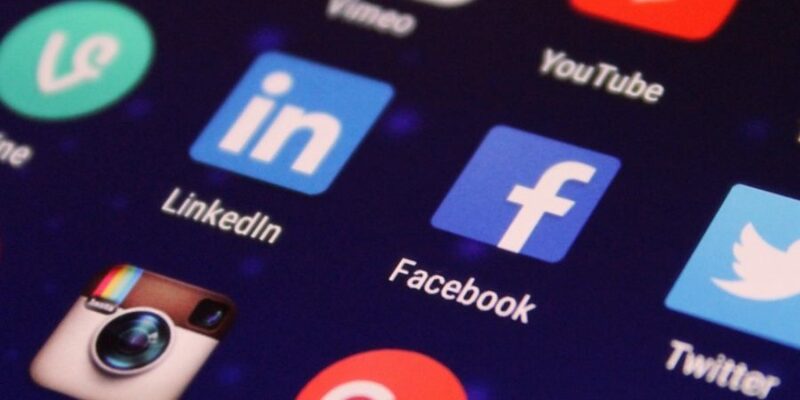 But I have seen what social media can do, and I am convinced that embracing this important communication medium can only help an organization down the road. Still not convinced? Let me admit that social media can take A LOT of time, and given staffing concerns and time constraints, that can seem daunting to many Writing Centers. But it is possible to bite off what you can chew, metaphorically speaking, and step things up incrementally. To prove this, I’ll give a real-life example from early in my UW-Madison Writing Center days (meaning Fall 2017). 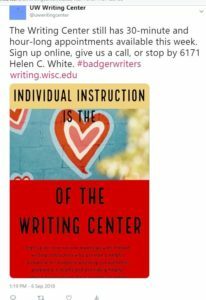 “Individual instruction is the (heart) of the Writing Center” Twitter post at the start of the semester garnered a lot of views. Maggie typically posted information about our online locations (email and skype instruction), and she also created posts that provided insight to the joys of the Writing Center. One of my favorites was a photo that she took in the Writing Center after the receptionists had sharpened boxes of pencils for our satellite locations. She coupled it with something like this: “There’s nothing better than freshly sharpened pencils.” I loved how easily one could convey a mood, an aesthetic even, with a few words and an image. Maggie also added events (such as workshops and special events, like Midnight Madness) to our Facebook page. Followers could be notified, then, of upcoming events and could even indicate their plans to attend. For me, my goal came down to amplifying my messaging about workshops. I figured that if I was spending a good amount of time on organizing and editing the descriptions of the workshops (which make it into our print Writing Center Guide, as well as on our website and in email blasts), I should get those messages to as many people as possible, and social media might reach audiences that we weren’t yet reaching. And any reaction to our postings were the other side of the conversation that we had started: we would have proof that people were listening. Creative titling led to creative imagery. Note: Yoda is a Jedi Master. I worked in various aspects of the publishing industry, but my favorite position, in addition to writing, was in marketing. One of my favorite tasks was reviewing the proposed book covers. The authors would give us a sense of what they thought should be conveyed (specific moods, especially) and it was up to our artists to translate those ideas into image. Though I can’t quote any sources, I know that image is one of the primary drivers of engagement with social media posts (pictures just grab us faster than words do), and I wondered if I might be able to make images that would represent some of our workshops, similar to how a book cover might encourage you to pick up a book. Thankfully, in the interest of time, I discovered a new Adobe product called Spark that provides templates for the creation of images, specifically for social media. For the most part, I’ve focused on our undergrad workshops since we are always looking to build our undergrad participation (graduate student participation is typically very healthy). New workshops for undergrads and grad students alike have also been a focus. While an image to help people conceptualize a workshop—or get a sense of how fun or helpful it will be—have helped publicize our undergrad workshops, photos of real-life people still seem to garner the most views. 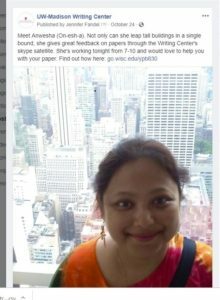 Some of our largest engagements via Twitter and Facebook have happened when our audiences have a chance to get to know our instructors (in the case of the posting about skype featuring Anwesha below) or distinguished guests at the Writing Center (our Writing Is Power event poster is a good example). When it comes down to it, for those unfamiliar with the work of Writing Centers, it’s helpful to see a smiling face and know that that’s the person you might meet. People really bring the views! Our Facebook post about skype instruction helped encouraged more students to give it a try. We are always thrilled when a campus partner (in this case, College Library) decides to post to Twitter about one of our events. College Library is primarily for undergraduates–a target audience for us. It takes a while to build an audience, and the tricky thing about the number of platforms out there is that there’s no universal way of reaching everyone you want to reach. From what I’ve observed, Twitter seems to be a good platform for sharing information (particularly about upcoming workshops) with campus partners. Indeed, based on the interests of some of our campus partners, they know when particular workshops are coming up and sometimes even tweet info to their followers. 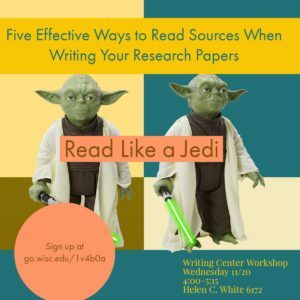 Because of the convenience of including people in the message (@uwwritingcenter), we’re always aware of mentions, which help me determine what groups might be worth reaching out to—what relationships could be strengthened with a meeting, email, or phone call. Facebook seems to be a good all-round medium, as indicated by how many people’s moms (hi Mom! )—and even grandmas—are on the site. Seriously, though, it’s a place where a lot of people go when searching for information, and it seems worthwhile to continue to post information there. Additionally, posting info to the Events section can help followers see what’s coming up. 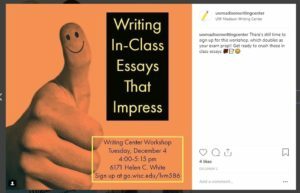 This is an Instagram post advertising the Writing In-Class Essays That Impress workshop this semester. In speaking with the communication manager at the Center for First-Year Experience, I was told that Instagram is where they are focusing their efforts in terms of directly reaching and interacting with students. I set up an account and then realized that a phone is really necessary (I’m often posting from my work computer). In a fortuitous discussion, I found out that our Writing Center TA Amy Gaeta loves Instagram. I am indebted to Amy for getting us started; her fun and casual voice works well with Instagram, and she has brought our audience to 221 followers in just two months. Social media lends itself well to conversation and interaction, as well as education of current and future audiences. Communicating online, where people can take action by clicking a link or forwarding a message, is crucial for the opportunity it gives an organization to see that people are listening. 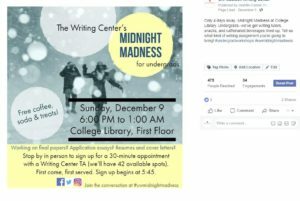 A successful Facebook post for our undergrad finals week tutoring event Midnight Madness. In terms of future plans for social media, there’s an endless horizon. 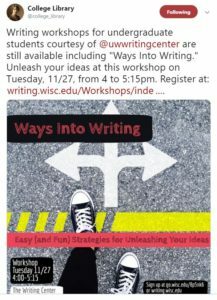 UW-Madison’s Writing Center runs a lot of different programs and events (the Writing Fellows program, the Writing Across the Curriculum program, our Outreach Program, Madison Writing Assistance, and our social justice series), and provides a multitude of services (from in-person instruction to workshops to the online Writer’s Handbook to our blog), and I think that it would be worthwhile to expand our conversations to encompass all that the UW-Madison Writing Center does on a daily basis to support the university community, the Madison community, the writing center community, and, perhaps, the global writing community as a whole. Thank you, Jen Fandel, for sharing your successes in using social media to enhance the outreach of Writing Centers. I especially like how the endpoint is to use social media to bring student writers into one-on-one contact with the people staffing the Writing Center. Thank you for posting this, Jen! It’s wonderful to see behind the scenes how much effort goes into our social media footprint! It’s great how many people are reached using these strategic choices based on the platform and audience–the Instagram followers, especially, are impressive in so short a time! I love the idea of posts introducing students to the Writing Center tutors, as well; to echo Russ, it’s a great way to use a particular technology to emphasize the one-on-one contact at the heart of Writing Center work. Hello Jen! I especially enjoyed your insights into how social media can help us identify which campus partnerships the Writing Center might want to cultivate or strengthen. I typically think about social media as a way to reach individual users, so it’s helpful to think about how it might foster cross-campus relationships between organizations as well. I am curious, though, about what it would take to get more students (and particularly undergraduates) to follow us on social media. I know I’ll be thinking about that with renewed energy after reading your post! Thanks for this wonderful post, Jen! It was great to learn more about all of the strategic planning that goes into developing the WC’s presence on all the different social media platforms. As an instructor for undergrad workshops, I really appreciate all of the work that you’ve put into the new poster/post designs. Not only are they easy to read and visually appealing, but they’re also quite playful. Or, rather, each post/poster/image’s playfulness seems to perfectly match the mood of the workshop being publicized. I completely agree with you that images, especially images with people, work to soften and humanize the workshop spaces, which is so important, especially for undergrads who are new to the workshop scene. Thank you, thank you, thank you!!! Thanks for all the work you do to spread the word about the writing center’s work, Jen! I look forward to seeing how the instagram following continues to grow, and how the visual attracts people to the center. Jen, thank you. This post made me reflect on my research process when I began developing the Instagram page for the Writing Center at UW. While yes, social media is an amazing promotion tool, as you dutifully note, I realized how much social media has expanded me as a creative thinker. When I thought about a writing center focused on Instagram, I was a bit lost: “Wait, what am I going to take photos of? Writing? People talking? Workshop classrooms?” All these options seemed so boring to me and would fail at attracting students. In a way, running the Writing Center Instagram has productively pushed me to conceptualize “what counts as ‘writing-related” and it gives me a chance to add a fun, and more personalized touch to the Writing Center identity. I am looking forward to working with you and the Writing Center team as we expand our social media presence and hopefully excite new writers. This is an inspiring inside look, Jen, thank you! As someone who personally uses social media very little, I’m surprised at myself for leaving this post much more eager to “embrace” social media for marketing and educative purposes – you make a persuasive case! Thank you for giving us this window into the strategies behind our social media accounts! It was fascinating to read. I have absolutely loved the posters you’ve created for events like Midnight Madness and our workshops. They contribute to an ethos of friendliness, openness, and honestly, coolness/hipness! Your last paragraph was particularly thought-provoking; I loved what you said about our writing center’s online presence potentially being part of the global writing conversation. I have already witnessed our blog being used as a resource on the teaching of writing and the training of peer tutors. The more people we can draw into the conversation through our social media accounts, the better! Thank you again for sharing this post, Jen.